When you purchase Enfūz, you get a box containing 30 packets of capsules and tablets. All you have to do is take one packet a day. You choose the time of day. What Is In Each Packet? • Multi-vitamin/mineral from natural (primarily vegetable) sources. Learn more about the formulations by clicking here. Why should I consider Enfūz? Enfūz is based on six specific benefits for health consumers. • Convenient - Get everything you need by just taking one handy package of tablets/capsules each day. • Save money - You save up to 46% compared to purchasing the different components in Enfūz individually. • Real results - Enfūz is not a fad. It is formulated based on decades of real science and clinical trials. 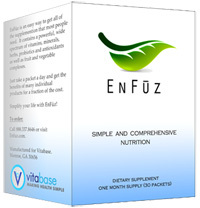 • Complete - Enfūz contains ALL the nutritional supplements that are widely recommended. Likely, it can be the only product you take. • High Quality - The ingredients and manufacturing of Enfūz represent the best quality available in the industry. • Affordable - Just $1.00 a day. Learn more about these benefits by clicking here.